As I discuss in this question, by far the most popular school of Hindu philosophy is the Vedanta school, which bases its tenets on the doctrines laid out in the Brahma Sutras, a work by the sage Vyasa that summarizes and systematizes the philosophical teachings of the Upanishads. (You can read the Brahma Sutras here.) I'm interested in the epistemology of the Vedanta school. Perception and inference, similarly authority and analogy, presumption and negation - these are the six means of valid knowledge for those who think like us. Charvakas speak of one; the Buddhists and the Vaisheshikas speak of two; Bhasarvajna and the Samkhyas speak of three; Udayana and others speak of four; the followers of Prabhakara speak of five; we and those well-versed in Vedanta speak of six; the Pauranikas, however, speak of eight, adding inclusion and tradition. I'm interested in the part in bold. The "we" refers to the followers of the Purva Mimamsa philosopher Kumarila Bhatta. Narayana Bhattar is saying that the Vedanta school accepts the same six Pramanas that Kumarila Bhatta does: Pratyaksha or perception, Anumana or inference, Shabda or authority, Upamana or analogy, Arthapatti or presumption, and Anupalabdhi or negation. Now within the Vedanta school, there are numerous philosophies, including Adi Shankaracharya's philosophy of Advaita, Ramanujacharya's philosophy of Visistadvaita, Madhvacharya's philosophy of Dvaita, Chaitanya Mahaprabhu's philosophy of Achintya Bheda Abheda, Nimbarkacharya's philosophy of Dvaitadvaita, and Vallabhacharya's philosophy of Shuddhadvaita. 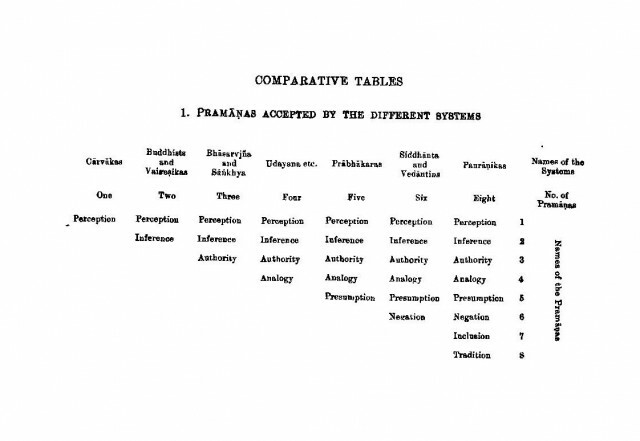 My question is, do all these Vedantic philosophies agree on this list of six Pramanas? Or do different Vedantic philosophies believe in different numbers of Pramanas? If different Vedantic philosophies do differ on this, then the figure of six Pramanas would probably be for Advaita, since I've heard that Narayana Bhattar may have been an Advaitin. I also found out from this forum post that this is summarized in an Advaita saying "Vyavahare Bhattanayah", which means that from the relative perspective, Advaitins agree with Kumarila Bhatta. But apart from Advaitins, most if not all other members of the Vedanta school agree on the number of Pramanas. Specifically, they agree with the Samkhya school's view that there are three Pramanas: Pratyaksha or perception, Anumana or inference, and Shabda or scriptural testimony. Let me go through various Vedantic philosophies one by one. The Pramanas or the Means of knowledge are three:- Pratyaksha or Perception, Anumana or Inference, and Shabda or word. Anupramana is of three kinds, viz., perception, inference and authoritative communication. Direct Perception, logic and Vedic revelation are three sources of actual knowledge. 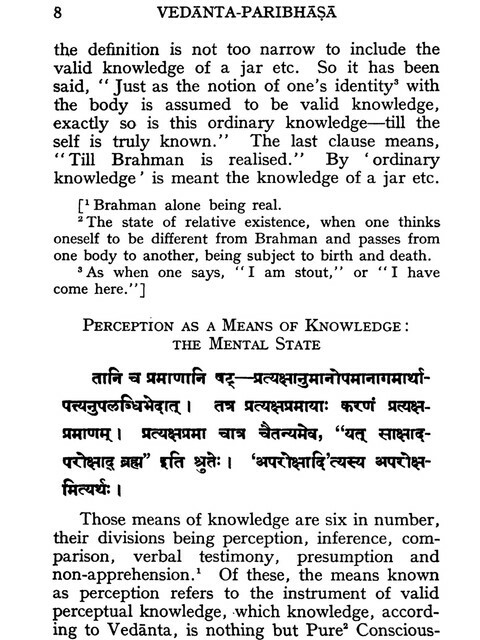 The followers of Nimbārka admit only three [pramāṇas] (perception, inference and testimony). Not the answer you're looking for? Browse other questions tagged philosophy vedanta advaita purva-mimamsa pramana .